Last of SS501 to make a solo debut, Kim KyuJong’s teaser photo had various ‘extraordinary’ points. Heavy make-ups, pearl necklace, female clothing with white hairstyle... immediately after it was being released, there was a heated attention among music fans as well as in various online communities. There are different types of reactions, from curiosity regarding his new attempt, to negative responses. 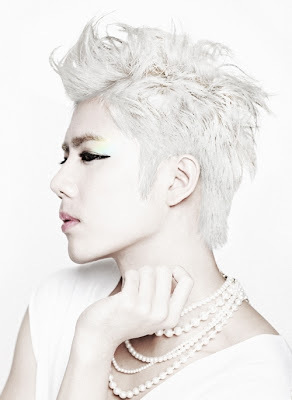 Kim KyuJong’s dressing as woman hides 2 meanings. First is, the wholly white make-up signifies that even though there are diverse colors on the inside, he will break off from all of them and will show his own set of color in his performance.